Note : Coupons vary every week and by zip code. - 40% off oil paints, acrylic, brushes, and fine art. - 80% off Renaissance custom frames & More. Present your military ID card and save 10% everyday. - 70% off 2+ Classic Collections & Renaissance custom framed pieces. Valid at your local Michaels store. See fine print for more information. - Michaels Stores accepts competitors coupons. - Michaels will match any competitor’s price. - AARP members get a 10% discount every day. In Store: Print coupon or show on mobile, get 20% off everything including sales items at Michaels stores. To use online, enter Michaels coupon code: THANKYOU417 at checkout. In Store: Simply show coupon in Michaels stores. To use online, enter Michaels coupon code: 30EASTER1517 at checkout. Print for Michaels stores, enjoy a $10 discount on any purchase over $40. Online: apply code: GET10APR1217 at cart page. In Store: Buy more yarn save more, get $5 off every $25 you spend on yarn. In Store: Print this coupon for a $5 discount on every $25 you spend on jewelry making items. Online: Use Michaels coupon code: 5OFF15FORYOU at checkout. In Store: Print coupon or show on mobile device in store for a 30% discount on your total in store purchase of regular priced items. Buy more save more storewide, get $5 off every $25 you spend on your entire purchase. Exclusive For members. Print or show coupon on mobile phone to redeem in store. Get 60% off any one regular priced item. Note: If you are not a Michaels Rewards Member, you can sign up here, its free! Get an additional 20% off halloween items, not valid on Christmas items and trees. Print coupon or show on mobile, get 15% off everything including sales items at Michaels stores. Fine art acrylic, water color, oil paints, brushes, pencils, and pastels. Print this coupon for michaels stores and get a 15% discount storewide, includes sale items. Print this coupon and get $10 off when you spend over $40 at Michaels stores. 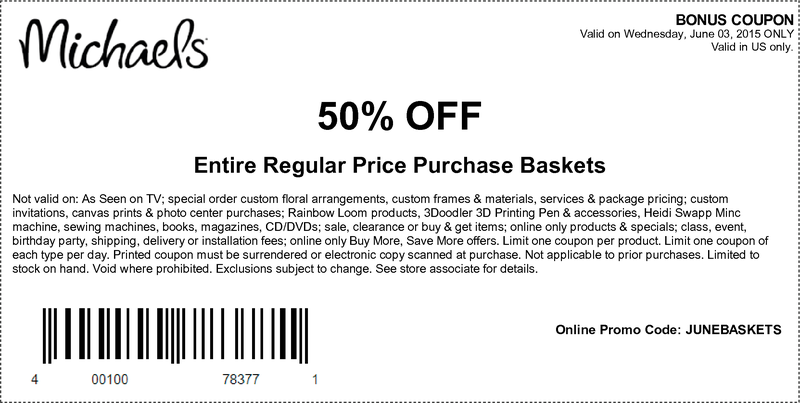 Print out the coupon and present it at Michaels arts and craft stores for a 50% discount on regular priced baskets. Up to 50% off martha stewart crafts, baskets, acrylics, paint bruches, pencils, markers, & baking pans. Yes! Michaels does offer printable coupons. Usually their in store coupons renew every week, their 40% off item and their 20% off storewide coupons seem their regular discount. However they do give some great coupons for their individual products such as bakeware items, fabrics, stickers, custom framing, art supplies, sewing products and more. 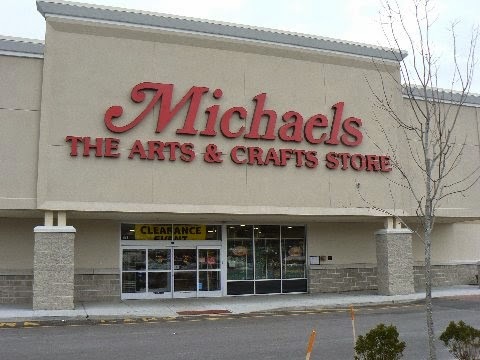 Michaels store is a great place to buy all of your arts and craft supplies. They carry supplies for everything including paint, scrapbooking, baking, jewelry making, sewing, and even items to help you plan the perfect wedding. Whatever your crafting hobby is, use the coupons above to make your next big project and save money while your creating.